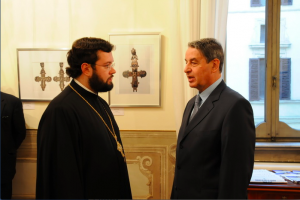 An exhibition marking the 1025th anniversary of the Baptism of Russia is being held at the Russian Centre of Science and Culture in Rome on 27 September – 4 October 2013. Its co-organizers are the Embassy of the Russian Federation to the Vatican, the Federal Agency for the Commonwealth of Independent States, Compatriots Living Abroad and International Humanitarian Cooperation (Rossotrudnichestvo), and the parish of the Church of St Catherine the Great Martyr in Rome. Displayed at the exhibition are thematic photographs selected by the Rossotrudnichestvo and the State Historical Museum, as well as the collection of books on the history of Christian enlightenment of Rus’ and the paintings by Natalia Tsarkova, Vatican’s official portrait painter and a parishioner of the Church of St Catherine. During the opening ceremony, H.E. Mr. Alexander Avdeyev, Ambassador Extraordinary and Plenipotentiary of the Russian Federation to the Vatican, and Archimandrite Antony (Sevryuk), rector of the Church of St Catherine in Rome, addressed those present, reminding them about the importance of the Baptism of Rus’ in the history of the Russian world, as well as about the influence of Orthodoxy upon the shaping of language, literature and culture of the Slavic people. Among those present at the opening ceremony were hieromonk Avel (Usachev), cleric of the St Nicholas parish in Rome; staff members of the diplomatic institutions, scholars and cultural figures, representatives of the mass media and parishioners of the Moscow Patriarchate’s churches in Rome, website of the Church of St Catherine in Rome reports.